Latest Snowden leak is memo published by Guardian that contains plea for access to US officials' Rolodexes and cites acquisition of 35 world leaders' phone numbers, some of which were "tasked" by the spy agency. The heads of state of Germany, Brazil, and Mexico may be far from the only world leaders who've reportedly attracted the attentions of the US National Security Agency. An agency memo leaked by Edward Snowden and published by the UK's Guardian newspaper Thursday contains a plea from the NSA for access to US officials' "Rolodexes" of contacts -- including "foreign political or military leaders" -- and mentions one instance in which an official provided 200 phone numbers for 35 world leaders. Forty-three of those numbers, previously unknown to the agency, were "tasked" by the NSA, along with "several other" of the numbers. "Thus far," the memo reads, "the PCs [intelligence production centers] have noted little reportable intelligence from these particular numbers, which appear not to be used for sensitive discussions. However, these numbers have provided lead information to other numbers that have subsequently been tasked." Though the 35 world leaders aren't named in the memo, its publication may well contribute to growing unease in Europe (and elsewhere) over the NSA's surveillance activities -- an unease that's affecting US relations with its foreign allies. The 2006 memo, which the Guardian reports was issued to staff in the NSA's Signals Intelligence Directorate (SID), arrives a day after German Chancellor Angela Merkel called President Barack Obama to ask if her cell phone was a target of the NSA. Merkel was reportedly "livid" over the possible monitoring, and Obama's less-than-conclusive response may not have done much to put her mind at ease. And on Monday, French Prime Minister Jean-Marc Ayrault called on the US ambassador in Paris to explain a report in Le Monde that telephone communications of French citizens are intercepted on a massive scale by the NSA. Director of National Intelligence James Clapper's official response to the Le Monde report also seemed to some to be less than reassuring. 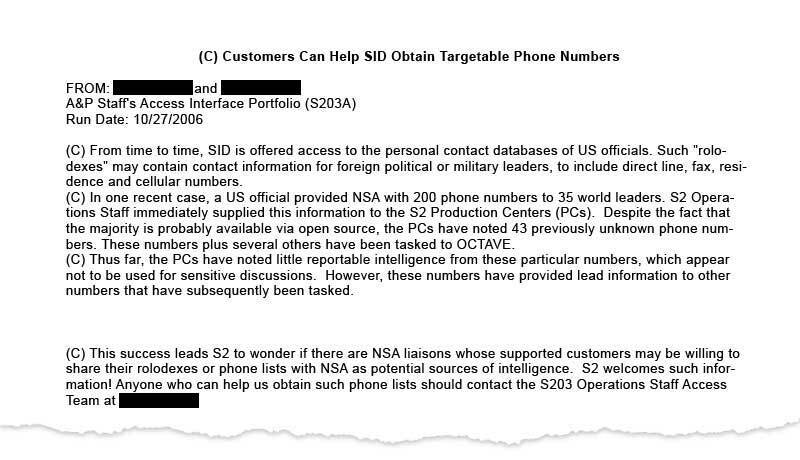 "This success leads S2 [signals intelligence] to wonder if there are NSA liaisons whose supported customers may be willing to share their rolodexes or phone lists with NSA as potential sources of intelligence. S2 welcome such information!" The Guardian said it asked the Obama administration for comment on the memo and was referred to remarks made by White House press secretary Jay Carney at Thursday's daily briefing. "The [NSA] revelations have clearly caused tension in our relationships with some countries," Carney said, "and we are dealing with that through diplomatic channels." "These are very important relations both economically and for our security, and we will work to maintain the closest possible ties," he added.